Carlton Kirby has commentated on the Grand Tours for Eurosport for over a decade. Over that time he has devised a way of recording what happened on each stage of a 3 week race onto a single piece of A4 paper. It’s an extraordinary document that any bike fan will spend hours poring over as they remember each stage of the race. Here’s Ride Velo’s guide to what all those symbols denote and mean. The top row shows the stage number, length of the stage in kilometeres and the arrival town. The stage number is highlighted in orange for a Time Trial, green for a sprint stage and pink for a mountain stage. Included here is a sketch of the elevation profile which marks each intermediate sprint stage with a dot. Any categorized climbs are marked by their level of difficulty from 4 to H (Hors Categorie or ‘unclassified’). The stage 8 profile to Station des Rousses, for instance, shows that there was an intermediate sprint about a third of the way through the route, followed by a category 3, category 2 and then a category 1 climb. Thomas (9) won Yellow and Green jerseys. His teammate, Kiryienka (3) wears Green on his behalf. The next row shows who won each jersey at the end of the day with the rider’s number highlighted in the appropriate colour: Yellow (leader’s jersey), Green (sprint points jersey), Pink (King of the Mountains jersey), White (best young rider), red circle (most combative rider). If a rider has 2 jerseys e.g. leader + points, the number in the bottom right corner denotes who is wearing the jersey on his behalf. While Geraint Thomas (9) won both the yellow and green jerseys on the opening Time Trial, his teammate, Kiryienka (3) got to wear the green jersey. The team leading the team points competition is written down at the end of this row (at the 2017 Tour de France Sky led this from Stage 1 all the way through to Stage 21). There’s usually a brief comment here on what the conditions were like on the day (‘wet’, ‘wind’ or the temperature, 36 c). Below this we have the riders who were in the breakaway. Sometimes there are too many list, so on stage 18 and 19, Carlton has written x49! and x51!. You’ll often find that the number of the rider winning the combativity award for the day is also listed in the breakaway. If it’s a mountain stage Carlton will list the main climbs of the day and highlight them in pink (Stage 12 + Fer, Telegraph, Galibier). If it’s a flat day this space will be used for comments like 111 (Sagan) DQ (disqualified) 91 (Cavendish) shoulder. The last space allows space for any further comments like on Stage 19: ‘Sprinters rest for 21. GC rest for TT’. The thicker blue lines separating stages 9 and 10, and stage 15 and 16 denote there was a rest day in between. 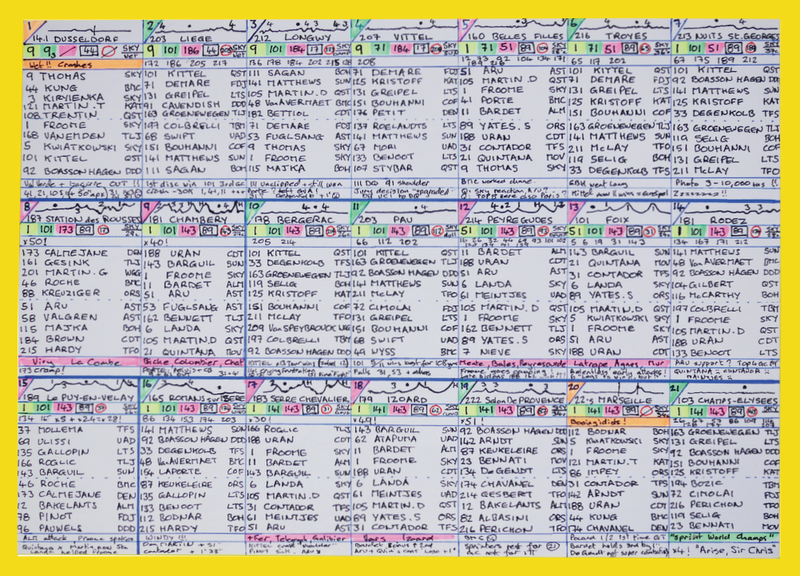 While the codec was devised as a quick and easy way of reminding Carlton what happened over the three weeks as a commentator, it’s a fascinating way for the cycling fan to look back on what happened on each Grand Tour. As you look over each day’s results you’re transported back to that day and all the memories come flooding back. “Froome goes camping,” is when he rode off the road and nearly ended up inside a camper van and “Landa helped Froome” reminds us of the support the Yellow Jersey got from his team. Perhaps one of the most interesting aspects of the 2017 Tour was how Froome never won a stage over the entire three weeks, his highest finish being third on Stages 5, 9 and 20. And another significant piece of information is that Team Sky led the team points competition from Stage 1 all the way through to the last day in Paris, revealing their strength in depth and, possibly, the real reason behind Froome’s historic fourth Tour de France victory. Ride Velo produced an enlarged version of Carlton’s Tour de France 2017 Codec onto an A3 poster. That limited print run of 100 has sold out, but we plan another print run of last year’s Giro and Vuelta in the new year, so keep checking our website, Twitter and Facebook feeds to see when they are released. The Tour de France version sold out within hours of being personally signed by Carlton, so you’ll have to be quick if you want to get your hands on a copy!